Type: EQUIPMENT. Detail: COMPUTER. Product Code: M810. The MILLENNIUM ChessGenius utilises the ten time world computer champion, Chess Genius, created by Richard Lang. 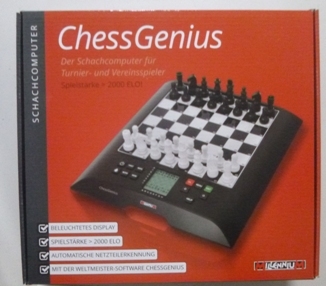 Unlike, other chess computers on the market the Millennium Chess Genius plays to a strong club playing standard, approximately 2000 Elo. A lot of other chess computers claim to be suitable for all standards of player but in actual fact are not suitable for anything beyond a social playing standard, roughly 1400 Elo. An incredibly user friendly computer which utilises a press sensory board. Simply press down on the piece which you want to move and press again with the piece on the destination square. The computers response is displayed on the LCD. With its playing strength of more than 2000 ELO (according to international tournament standards) and due to its virtually infinite variable adjustment options it makes the perfect companion for all chess players, whether a beginner, club player or a strong tournament player. Please note POWER ADAPTER SOLD SEPARATELY so look up M811 (cost $25) if you prefer not to use batteries. Game Levels. Virtually unlimited number of difficulty levels. The average training time is adjustable. Total time per game is adjustable. Tournament Levels for strong players. Lower levels for beginners. 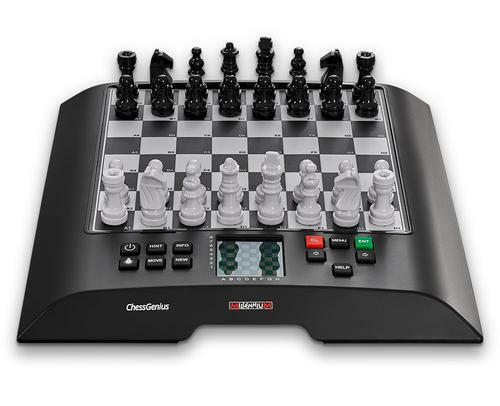 Designed for chess professionals. 20,000 opening positions. Versatile Analysis Mode. Position evaluation and main line. Input any chess positions. For Beginners, Chess Coach will warn of bad moves, offers a take back and makes suggestions for optimal moves. Displays all legal moves. Unlimited number of moves back and replay. Features: Easy system setup. Large display, board is backlit as well. Multilingual user interface. Play modes player vs. computer, player vs. player, etc. Energy saving mode when using batteries. Specifications: Processor ARM Cortex M4/48 MHzMagnetic, pressure sensor board. Text based, 7 language menuLanguages DE / GB / FR / NL / ES / IT / RUSoftware , Chess GeniusPower: 3 AA Batteries, included. Optional Power Adapter Sold Separately (M811 $25) . Dimensions, 11.8" x 10.8" x 1.2" . And in centimetres: Dimensions:approx 30 x 27.6 x 3 cmChess board dimensions: 20 x 20cm.